*This blog post is the fifth in a series of 6. If you haven’t already, please read part 1, part 2, part 3 and part 4. We are an investment bank. On average, how large are the risks that people of Gender J are accountable for vs. people of Gender K? We are a B2B business sales operation with 25% turnover in our sales teams. From the point of view of #1 customer, are our sales teams better this year (in tenure, training and capability) than they were last year? Why is graphing conceptually new for economics? This approach is new because of the number of angles from which the organisation can be explored. It is different from the sheer volume, velocity and variety of data in Big Data. Until now, it has been possible to use relational databases to carry out specific analyses from a single angle, for example, an analysis of risks allocated to people. (Think of a spreadsheet table containing rows of people listing risks). It has been very time consuming, however, to assemble the data from this single angle, to extract the information needed to complete it and cleanse it. And it has cost the same again to add an extra angle, or to repeat the analysis. Most consulting projects start off with lengthy data gathering stages, which can consume a good half of the resource, time and cost. And (despite the cost) this is often why clients ask consultants to help – they know the answers to their questions would be valuable, but that it would simply be too difficult for an internal team to assemble all that data in one place. Using a graphing database, it becomes possible to link all of these aspects once, and to use the model to stay up to date and to see the impact from multiple facets of the organisation. The simple change from ‘too difficult’ to ‘possible or easy’ is radical in what it allows organisations to do. Linking different aspects of an organisation reflects the reality of organisational life. We increasingly have ways of categorising activities and quantifying skills. We talk with our colleagues about skills mix, about the resources we will need going forward, about our clients and how we serve them, about who is responsible for what. These are the real conversations that we have about our business – and each part of the conversation is linked. The choices we make about who leads on which projects, about who handles which parts of the client relationship, has a real impact on how well we manage our business. It deals with the lumpiness of change. When change occurs, organisations have to adapt as connected elements linked together. And those connected elements end up with a lumpy item: people. Graphing databases allow you to deal with the complex connections between each stage of this chain. 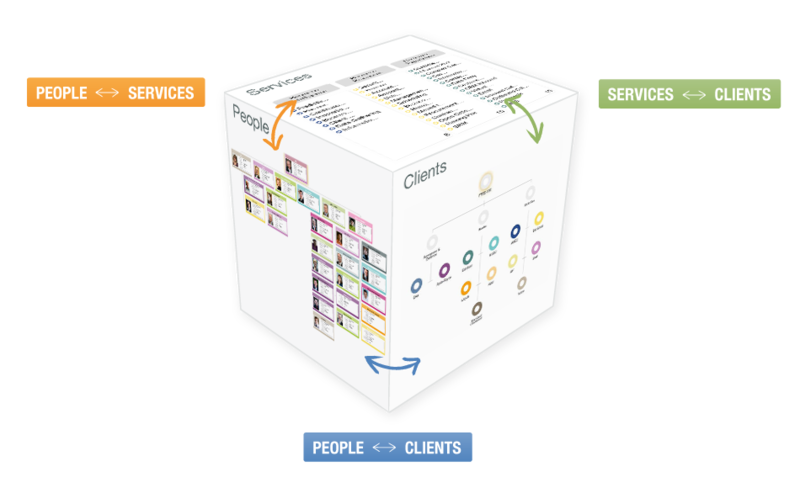 They allow you to treat the organisation as a multi-faceted cube. You can model just as much as you need on each ‘side’ of the cube. You can model the links between them, as they are, and as they change over time. And that is a revolution not only in saying how the organisation can be designed and managed, but also in capturing what the organisation is. *This is the end of part 5, please subscribe or visit our blog for the final part, “How HR, Finance & Strategy need to evolve for Organisation Design of the future”.